The Sunway Education Group welcomed a new batch of the Jeffrey Cheah Foundation (JCF) Community Scholars at a recent gathering at Sunway University. The gathering of new, existing and graduated scholars was targeted to help the new community scholars in getting to know each other. The annual get-together serves as an opportunity for seniors to share and encourage the juniors in their educational journey at Sunway University. “This scholarship is our way of saying we have faith in you and we believe in you. And because we have faith in you, you should therefore never lose faith in your own potential. “The JCF community scholarship has always been synonymous with the Jeffrey Cheah Foundation and is considered a highly valued social transformer. With this scholarship, we would like to encourage and support you, and motivate you in your journey to reach your full potential and aspiration,” she continued. 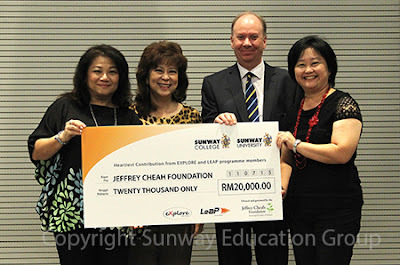 In conjunction with the get-together, there was also a cheque presentation of a contribution of RM20,000 from Sunway students of the LEAP Employability Training Programme and EXPLORE, a self-development programme for Pre-University students to the JCF for the benefit their peers who are in need. Also on hand to contribute back to their alma mater were Sunway alumni Dato’ Adrian Ooi and his wife, Adelaine Ooi who contributed RM5,000 in support of the Community Scholars. Alumnus Kid Chan and Alex Ooi also took the opportunity to make contributions to their almater. On hand to share their experiences were Community Scholars Joey Ooi who is currently pursuing the Diploma in Graphics and Multimedia, Angelia Pranthaman, BSc (Hons) Business Management and ex-scholar Bryan Chung of the Institute of Chartered Accountants in England and Wales (ICAEW) programme, currently undergoing training at BDO Malaysia. Each year, the JCF Community Scholarships are awarded to budding potentials from welfare homes and disadvantaged backgrounds to pursue studies at Sunway University and Sunway College. Since 2002, through the JCF Community Scholarships alone, Sunway has provided higher education to 144 scholars amounting to RM6.5 million. The JCF Community Scholarship, synonymous with the Jeffrey Cheah Foundation (JCF) is a highly valued social transformer to encourage and support students, motivating them in their journey to reach their full potential and aspiration. The JCF is the first-of-its-kind in Malaysia within the field of private higher education, modelled along the lines of one of the oldest and most eminent universities in the world, Harvard University.